SSC JE Admit Card 2019: Aspirants applied for the SSC JE Exam 2019 can download the SSC JE Hall Ticket 2019 which will be released in the months of September 2019 and December 2019. Recently, the Officials of the Staff Selection Commission declared the SSC JE Exam Date 2019 for Computer Based Test and the Written Test. So, the candidates should wait for some more time to get their ss.nic.in Junior Engineer Admit Card 2019. Moreover, the hopefuls willing to join as Junior Engineer should have a clear idea on the SSC Junior Engineer Selection Process 2019. All the details that a candidate wants to know are provided in this article. So, this makes an individual task easier. Down Here, you can check the table which gives you overall information of the SSC Junior Engineer Admit Card 2019. The Staff Selection Commission conducts several Tests for various Junior Engineer posts as a part of the SSC Junior Engineer Selection Process 2019. The process includes 5 rounds and the SSC JE Exam Date 2019 for the Paper-I and Paper-II Exams are declared by the Higher authorities of the Staff Selection Commission. PST, PET, Medical Test Rounds of the Interview is done in the appearance of the Officials only. So candidates please make a note of it. As per the Recent notification, the Officials of SSC scheduled the SSC JE Exam Date 2019 for both Paper-I and Paper-II Exams. Accordingly, the Computer Based Test (Paper-I) is scheduled from 23rd To 27th September 2019 and Written Test (Paper-II) on 29th December 2019. So, the candidates need to wait for some more time to get the SSC JE Hall Ticket 2019. The officials declared that the ss.nic.in Junior Engineer Admit Card 2019 will be released one week before the Examination for both papers. Hence, patience is a more important factor a candidate should have to attempt such a competitive exam. The candidates were asked to carry any one of the given Identity proofs for verification purpose to the Examination Hall. The Officials are not allowing the candidates those who attend the examination hall without the ID proof or Certified documents along with them. Make sure that you take essential Documents. Candidates are advised to keep their Admit Card safe till the date of Joining. Because Admit Card is useful at the time of joining. The aspirant should bring their Valid Identity proof at the time of Exam for verification purpose. Then, you will find the home page of SSC on your computer screen. Now search for the Scrolling link of ss.nic.in Junior Engineer Admit Card 2019 and click on it. Then, you will find the Login page asking to fill the required fields. Fill the details such as Registration Number, Password, Date Of Birth, Captcha. Once recheck before you submit the details. Finally, SSC JE Hall Ticket 2019 appears on the screen. Download the Hall Ticket and make a hard copy of it for future use. 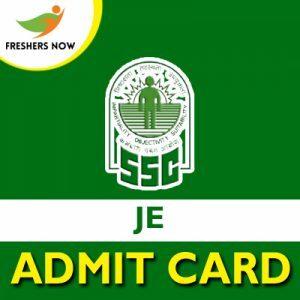 Finally, hope you all got a clear idea about SSC JE Admit Card 2019. To Know such similar details keep on visiting the web portal Freshers Now and also refer this information to your neighbors and Friends.